New technologies often go through a honeymoon phase where educators hold them up as the futuristic savior of learning. Today teachers can't get enough of those Kindles, iPads and MOOCs which promise to radically change education for generations to come. But this line of thinking has a long history. In the 1930s some people predicted that TV might allow students of the future to get a university education without ever stepping foot in a classroom. In the 1950s videophones and desktop computer machines were going to ease the crisis of overcrowded schools caused by the baby boom. And from 1934 until 1948 the first practical long-playing records were used almost exclusively by blind people who listened to the world's first audiobooks. But the techno-utopian educational technology of the 1920s was radio. 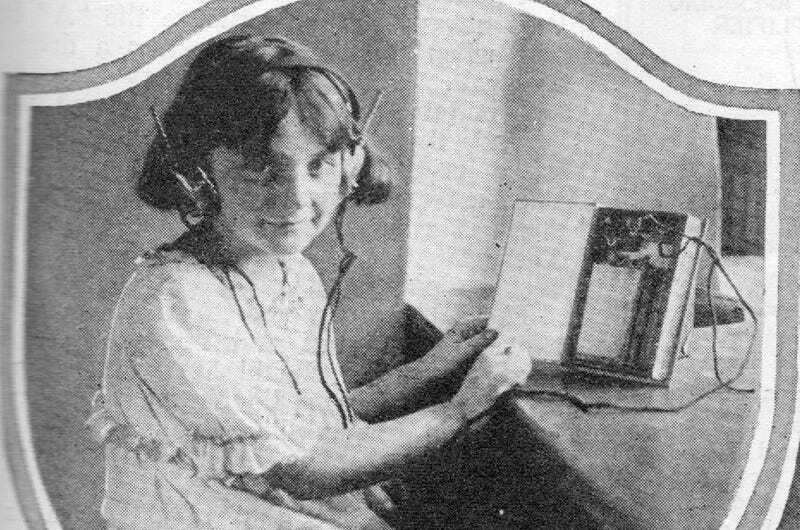 The November 1924 issue of Science and Invention magazine included a photo of a young girl wearing headphones — her book filled with the gadgetry that would allow her to capture her daily lessons from the ether. With the everyday added perfections in the transmission and reception of radio, such a remark as the above will soon be a thing commonplace. Little Mary Jane will enjoy her radio lessons as much as she now enjoys her bedtime stories. Everything will be an "open book" to her. A complete set in the shape of a leatherette covered book will take the place of bulky primers and readers. Home work will now be a great joy to the kiddies and lesson will be learned with much greater facility. Of course, if countless educational apps and audiobooks have taught us anything, it's that while technology might make homework more bearable, sometimes the only joy comes from being done with it.